Aluminum and vinyl are two materials used in the manufacture of blinds. Both materials come with advantages and disadvantages. Blinds, regardless of what material they are made of, serve the same basic function. They are used to shade windows and let an adjustable amount of light into a given room. 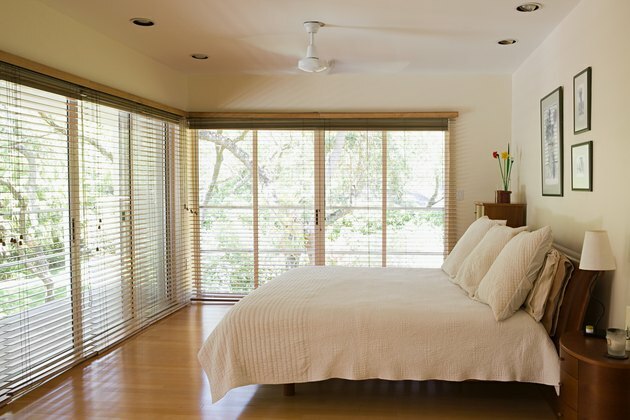 Window blinds can control the quality of natural light in a room. Aluminum blinds are strong and do not break as easily as vinyl blinds. Vinyl blinds, however, flex easier and do not tend to dent or crease. Vinyl blinds are also easier to clean than aluminum. Aluminum blinds are easier to repair than vinyl blinds; usually when vinyl blinds break, they are simply discarded. While vinyl blinds produced in the United States contain no lead, vinyl blinds imported from other countries may contain traces of lead. Vinyl is a lighter and weaker material than aluminum, so blinds made of vinyl break more easily. One disadvantage of aluminum blinds is that it's not as easy to manufacture them with special textures, such as wood grains, as it is with vinyl blinds. Aluminum blinds tend to be more energy-efficient than vinyl blinds; the metal blinds do a better job of reflecting rays from the sun, keeping rooms cooler during hot seasons. Vinyl blinds tend to absorb rays from the sun, resulting in a warmer room. Sunny rooms may benefit from the presence of aluminum blinds. The bigger the set of blinds, regardless of material, the more the set costs. Vinyl blinds traditionally cost less than aluminum blinds, and the difference in price between aluminum and vinyl increases along with the size of the blind. Texture can add to the price; for instance, vinyl blinds that have been manufactured to look like wooden blinds tend to cost more than blinds with no texture. However, both aluminum and vinyl blinds come in a range of prices, and a basic aluminum blind may well be less expensive than a highly designed vinyl blind. Both aluminum and vinyl blinds are available in a variety of styles and sizes and come in both horizontal and vertical designs. The width of the individual slat can vary anywhere from 1/4 inch to 4 inches. Vinyl blinds in particular offer a wide range of looks that include various faux wood finishes in a choice of colors.